Most major American artists have studied in Europe, and many choose to remain abroad. Indeed, during the late nineteenth century, several of the world’s most influential painters were American expatriates. 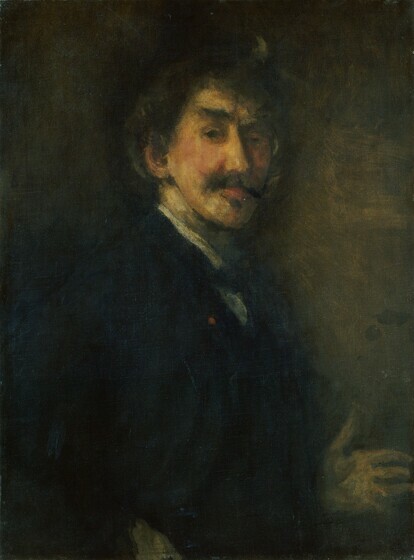 James McNeill Whistler led the aesthetic movement that cultivated color harmonies and simplified shapes as “art for art’s sake.” When a boy, he took drawing lessons in St. Petersburg, Russia, and then learned print techniques while making government maps in Washington, D.C. Later in London, Paris, and Venice, Whistler endlessly refined and adjusted his prints and paintings, often taking years to complete his abstracted stylizations. John Singer Sargent, hailed on both sides of the Atlantic as a society portraitist, was educated in Florence, Rome, and Nice by his wealthy parents. His avant-garde style, founded on the bravura brushwork of the seventeenth-century old masters Frans Hals and Diego Velázquez, gained popular acclaim. Making a sensational debut in Paris in his early twenties, Sargent became famous for his rapid execution of oils and watercolors. Henry Ossawa Tanner, son of an African American minister, left the United States partly to escape racial prejudice. After studying under Thomas Eakins in Philadelphia, Tanner departed in 1891 for Paris, where he won fame and awards for his paintings of biblical subjects. The Seine indicates that Tanner was familiar with the French impressionists' on-the-spot observations of nature. 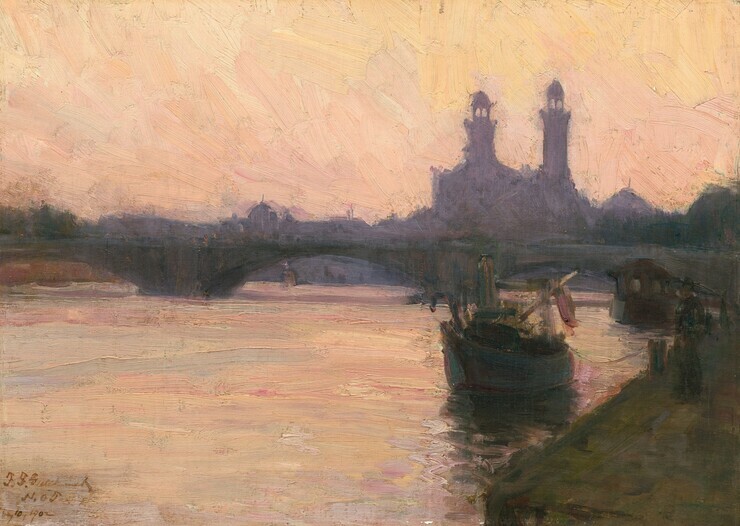 This tiny oil sketch reduces the Paris skyline to a violet band silhouetted between a pink sunset and its reflection in the river Seine. The Trocadéro Palace, an ornate exhibition hall built for the 1878 World’s Fair, dominates the view, while a lone figure on the shadowy dock recalls the mystical aura of Tanner's religious scenes. Another of Sargent’s friends was the French impressionist Claude Monet, with whom he shared a love of painting en plein air, or out-of-doors. 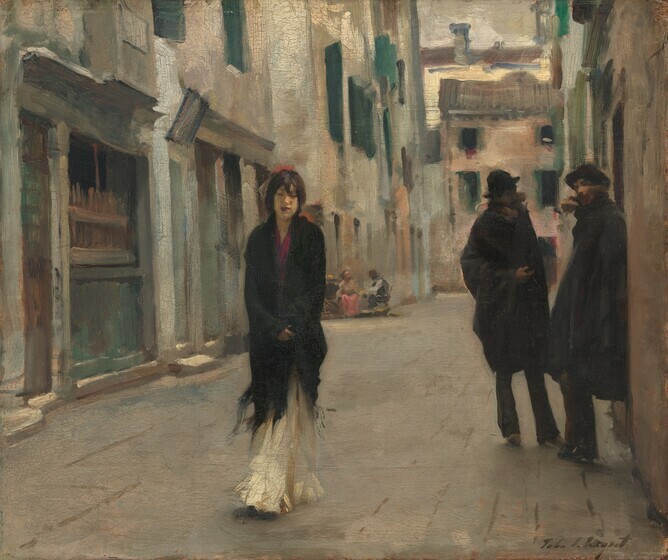 Street in Venice, created during the second of Sargent's numerous visits to that city, was done on the spot. Mediterranean sunshine penetrates the narrow confines of the Calle Larga dei Proverbi, a back alley near the Grand Canal. The emptiness of the silent street implies that Sargent depicted siesta, the time when many Italians rest for three hours at midday. One of two men conversing in the shadows is distracted by a girl strolling alone. Her skirt’s rustling hem and shawl’s flowing fringe are rendered with indistinct strokes that suggest her rapid pace will soon carry her beyond his lingering gaze. This combination of technical skill and emotional intensity goes far toward explaining why Sargent received more honors and medals than any previous artist, European or American. 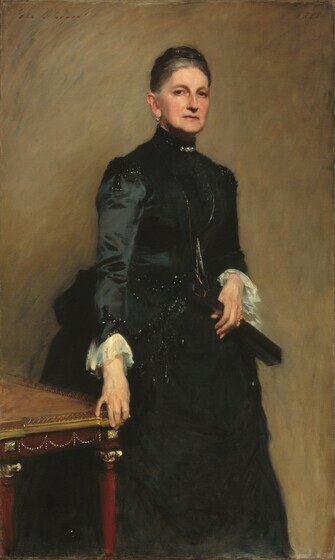 Eleanora Iselin, a banker’s wife, was portrayed in New York City during one of Sargent’s many transatlantic trips. Arriving for her first sitting, the sixty-six-year-old matron was appalled when Sargent insisted that she pose in the street clothes she wore rather than in one of the sumptuous French gowns carried by her maid. Sargent’s phenomenal success as a portraitist was due in part to his prominent New England colonial ancestry, which made him the social equal to or better of many of his patrons. Rebelling against his popularity, he continually raised his prices to discourage potential clients, but the higher costs had the opposite effect of placing his portraits in even greater demand. 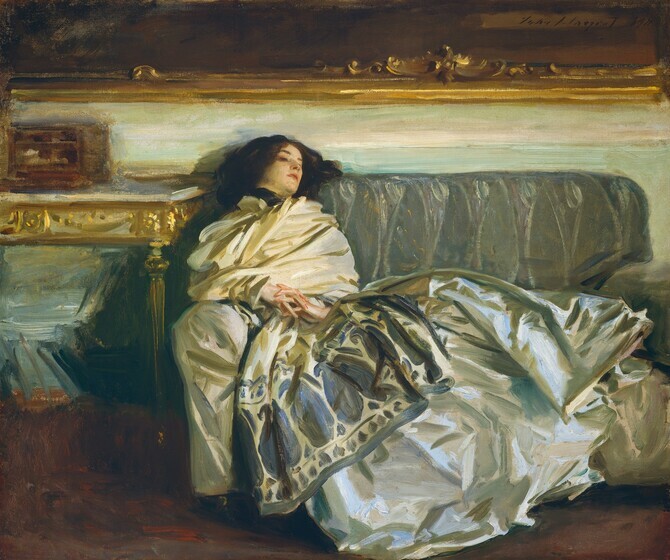 Exasperated by the demands of his sitters, Sargent proclaimed portraiture to be “a pimp’s profession” and by 1907 resolved never to accept another portrait commission. During his later years, the artist devoted himself to creating decorative murals for public buildings and to painting watercolors and small canvases purely for pleasure. In 1911 Sargent vacationed with his sister’s family in Switzerland, where he painted Nonchaloir (“nonchalance”). A casual character study instead of a formal portrait, it depicts Sargent’s niece Rose-Marie Ormond Michel, whom he nicknamed “Intertwingle” because of her agile, intertwined poses. Influenced by the “art for art’s sake” movement, the painter unified the color scheme with the amber light of a lazy afternoon. The straight lines of the posh furnishings in the Swiss hotel accentuate the swift brushstrokes used to delineate his niece’s fingers, hair, cashmere shawl, and satin skirt. Late in life, Sargent also returned to landscapes, working almost exclusively outdoors. He spent the autumn of 1908 relaxing on the Spanish island of Majorca. Valdemosa, Majorca: Thistles and Herbage on a Hillside is a tour de force of Sargent’s brushwork. Against the sandy soil, the sunny highlights that gleam from roots and twigs create abstract networks of white paint. Whistler inscribed "1861" at the lower right of this early canvas, but he reworked the picture extensively nearly four years later. He sketched the original composition in a letter to an associate and described the girl as "saying to her sailor: 'That's all very well my friend, but don't think you're the first.' You know, she winks and pokes fun at him." In this final revision, however, Whistler eliminated any risqué narrative and instead sought a mood of pensive isolation. The background remains intact from the artist's first sessions at Wapping, a dockyard on the river Thames, east of London. Painting on site from an inn called The Angel, Whistler created the whole scene en plein air. Against the bright turquoise water and sky, the ships' masts and rigging are quickly sketched in orange and brown strokes. For this work, Whistler hired Joanna Hiffernan, an artist's model known for her coppery red hair. She soon became his mistress and posed for The White Girl, also in the National Gallery. 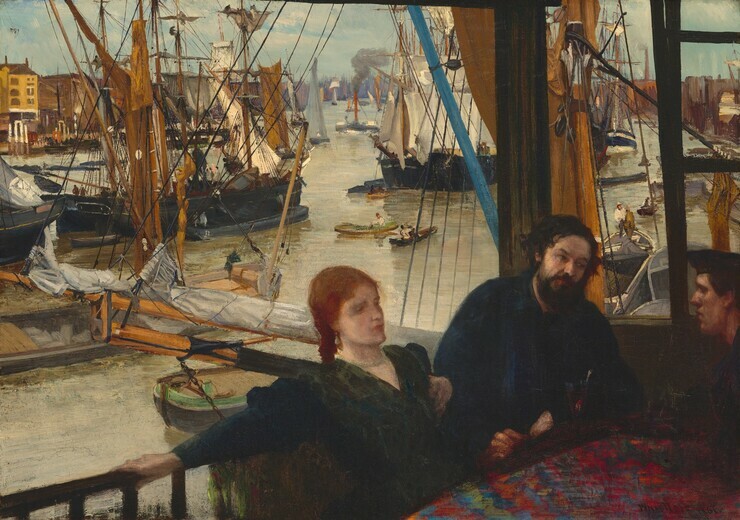 After finishing that composition in 1862, Whistler returned to Wapping. He repainted its foreground figure group into a harmony of russet browns and blue grays, which are darker shades of the pure oranges and blues in the setting. By its concentration on a consistent color scheme, this important canvas marks Whistler's major advancement toward "art for art's sake." After reworking the National Gallery's Wapping in 1864, Whistler decided to abandon painting outdoors. Thereafter, he boated on the river Thames to observe quietly London's mists, twilights, and starry evenings. Upon returning to his studio, Whistler created his later landscapes from memory or sketches. In Grey and Silver: Chelsea Wharf, the tenements and factories on the distant Battersea shoreline are transformed into a fantasy of spires and domes. A few diagonal spars enliven the quiet geometry of masts and hulls, docks and passersby. The subtle tonal scheme is composed entirely of muted variations on the complementary colors of blue and orange. Whistler stated, "As music is the poetry of sound, so is painting the poetry of sight." In other words, various musical notes relate to a dominant key, just as various colors relate to a unifying hue in painting. In writing a review about another nocturnal landscape, the British art critic John Ruskin accused Whistler of "flinging a pot of paint in the public's face." Whistler sued Ruskin for libel in 1878. When a lawyer asked whether two days' work justified that picture's high price, Whistler curtly replied, "No. I ask it for the knowledge of a lifetime." This famous retort established a legal precedent for artists' acquired experiences. Whistler won the case, but the proceedings left him bankrupt. Whistler claimed to excel Diego Velazquez, the seventeenth-century master from Andalusia, Spain. What creates the somber, Spanish mood in Whistler's Andalusian are the haughty beauty's backward swerve as well as the cool grays and warm tans that shimmer through her gown's black net fabric. The outfit, however, is no more Spanish than the model. Her layered sleeves and chignon, fashionable internationally during the 1890s, are worn here by Whistler's English sister-in-law. Ethel Birnie Philip, daughter of a sculptor, married in 1895. The next year saw the death of her sister, who was Whistler's wife. This elegant depiction of light gleaming in the dark, though, represents neither a bride nor a mourner. Whistler firmly stated, "Art should be independent of clap-trap—should stand alone, and appeal to the artistic sense of eye or ear, without confounding this with emotions entirely foreign to it, as devotion, pity, love, patriotism and the like." In Brown and Gold: Self-Portrait, the dapper artist shows himself in his mid-sixties with a monocle and a streak of white hair. The only strong color is Whistler's proudest possession, the red lapel rosette that he had received in 1889 as a knight of the French Legion of Honor. 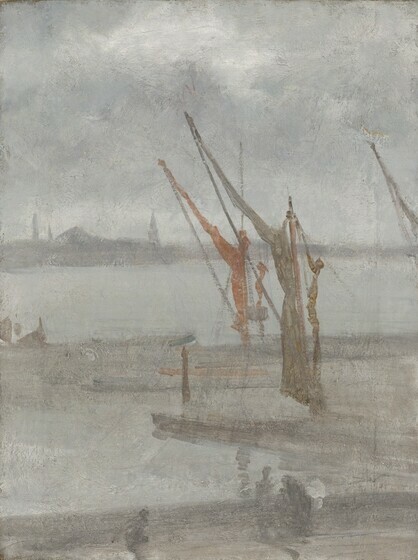 Hovering at the right is an abstracted motif that served as Whistler's signature after the 1860s. It is a butterfly armed with a stinger.